An amusing e-mail that has been circulated ‘In Sai Seva’ and “for the convenience of devotees’ tells of the revolutionary banking move in Puttaparthi, namely installation of a cash machine, provided by none other than the grace of Sathya Sai Baba acting from the beyond through the Sai Central Trust! Despite the ‘beautiful granite finishing’, it is not likely to attract devotees who want to part with much money. It would take a self-resurrection by Sathya Sai Baba himself to increase the cash flow. Or at least a public attempt to revive the embalmed body. If Sathya Sai, the Avatar of the Age, Creator of the Universe himself and Deity of all Deities, could not cure or resurrect himself, what chance for the average Joe Lunchbucket Hindu gurus? An ATM, too, hmm? Now, ‘Automatic transfer’ around Puttaparthi should be a breeze, don’t you think? It was a life-long specialty of the master, after all. Nice touch indeed, a spot of granite. If that does not start some HARD cash from starting to flow, I am at a loss. The story of the refrigerator-guru hit the news here in Holland, too, much to everyone’s amusement. It reminded me of famous Dutch prophet (and guru avant la lettre) Lou de Palingboer (1898-1968), who preached he was God incarnate and therefore could not die. When he inadvertently DID die, his followers did not believe it and surrounded themselves on top of his body, ‘to keep it warm’ until he would return… They are still waiting, it seems, even 50 years after his burial. For more on these western and eastern ‘masters of enlightenment’, I refer to my blog Enlightened or made light (http://chrisdokter.wordpress.com/2012/01/19/enlightened-or-made-light/). 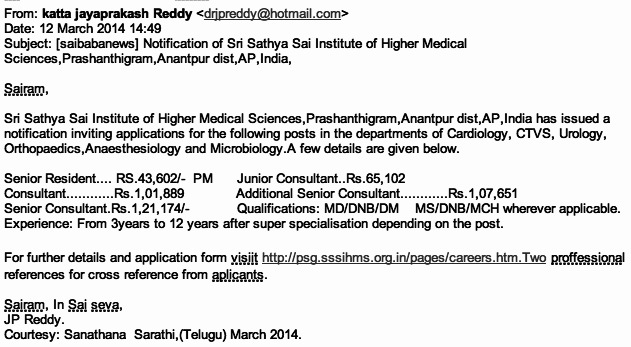 This entry was posted on March 16, 2014 at 12:20 pm	and is filed under Sathya Sai Baba. Tagged: Sri Sathya Sai Super Specialty Hospital. You can follow any responses to this entry through the RSS 2.0 feed. You can leave a response, or trackback from your own site. The story of the refrigerator-guru hit the news here in Holland, too, much to everyone’s amusement. It reminded me of famous Dutch prophet (and guru avant la lettre) Lou de Palingboer (1898-1968), who preached he was God incarnate and therefore could not die. When he inadvertently DID die, his followers did not believe it and surrounded themselves on top of his body, ‘to keep it warm’ until he would return… They are still waiting, it seems, even 50 years after his burial. For more on these western and eastern ‘masters of enlightenment’, I refer to my blog Enlightened or made light ( http://chrisdokter.wordpress.com/2012/01/19/enlightened-or-made-light/).